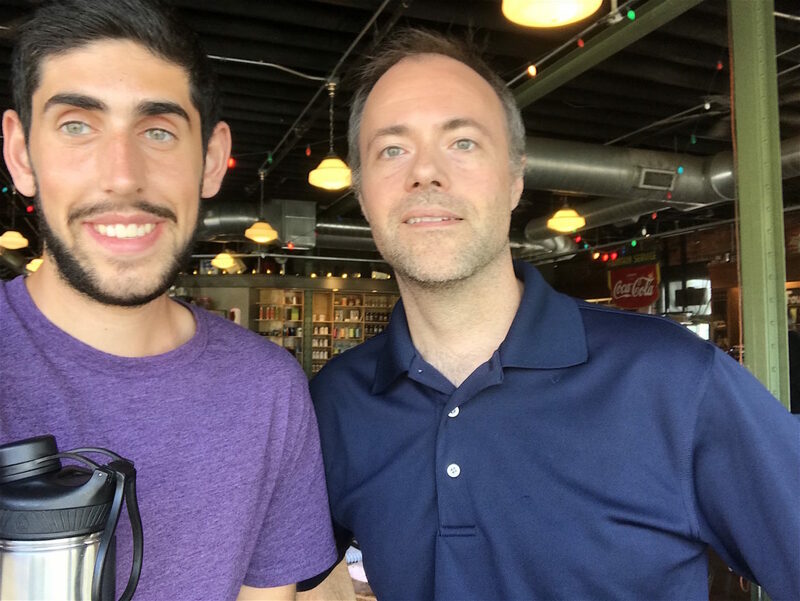 Jason Clayworth (right) and IowaWatch summer intern Matthew McDermott in a selfie at the Smokey Row Cafe in Des Moines on June 15, 2018. On Saturday, March 24, Iowa Gov. Kim Reynolds fired Finance Authority Director Dave Jamison and announced it in a statement from her office to the news media. Jamison was fired after two female employees made allegations of sexual harassment against him. Jamison was not given the chance to respond or review their complaints against him before he was fired and an administrative law judge denied Jamison’s request for unemployment benefits. Aside from the allegations of sexual misconduct, two state investigations into Jamison’s handling of state funds also are being conducted. The Des Moines Register’s Jason Clayworth is among the Iowa reporters covering Jamison’s firing since that announcement was made in March. Clayworth said he sees reporting as a public service. In an interview with IowaWatch, he discusses the pursuit of the truth, unbiased reporting and civic engagement. Here is a transcript of the interview, edited at places for clarity. McDermott: Can you tell me about Dave Jamison? How did you find out about this story and what brought you to it? How did you get interested in this story? Clayworth: Mr. Jamison was fired by the governor. To be quite honest this is an example of where the erosion of the media has been problematic because, let me take a step back. We found out that there were problems in the agency on March 24th. That was the day he announced he was fired. There are not reporters from The Register or any other media that regularly goes to or covers the Iowa Finance Authority. It just doesn’t happen. Clayworth: Yes, it is busy, but it also provides a level of oversight for the public. So, there has not been a lot of attention on this agency for years, years and years and years. So when this happened, when the governor took action to fire him and when she said it was for credible allegations of sexual harassment, that raised of course serious questions about what was going on in that agency. And that is when I started looking a little bit more closely and in depth on what happened, because I was interested not only with the issue of why Mr. Jamison was fired, that’s seriously important obviously, but shortly after he was terminated, we began asking questions. Like about things that were going on in the agency. So, besides the sexual harassment issue which can be salacious — it is the click generator, everyone knows that that is what people are interested in — but there are also some questions about how the agency was performing and if it was being run fairly and, in the public’s, best interest. Those are additional questions that are still not being answered — I should say fully answered. There are a number of investigations going on. The story that you probably saw, if I were to guess, is the one that caught your attention. Clayworth: Oh yeah, okay, good. Clayworth: … You know if, if Mr. Jamison is guilty of what he has been accused of, then those are serious allegations. On the other hand, this case raises some really important questions about due process. Because here you have a gentleman who, if, if these women are lying, he was fired without even a simple question being asked about it. That’s very serious and it’s something we should take seriously. Nobody wants somebody to be sexually harassed, but we also want and expect our government to act fairly and appropriately and so the unemployment appeal hearing raised some very serious questions about how our government’s operating and inherit justice in a system if what Mr. Jamison is alleging is true. McDermott: What was your process with the story, then, once you found out he had been fired? Who did you interview? How did you go about getting this information? Clayworth: So, one of the first things I did was request from the agency a list of its employees that had been terminated in the last five years. I did that because I knew that list would provide me names of people who might feel more freely to talk because people still employed have a lot to lose. Iowa’s whistleblower law is weak. It is so weak, and so it offers little or no protection to people. And so it was one of the first things that I’ve requested, I’ve maybe made 10 records requests to the agency at this point, everything from looking at their credit card receipts to Mr. Jamison’s texts that were on his state owned phone to, we’ve reviewed hundreds of emails at this point to key officers at the agency. McDermott: Why credit cards, out of curiosity? Clayworth: In my reporting, so one of the stories before this unemployment appeals hearing I wrote about, one of the stories from a former employee that I spoke with, and we quoted, we named her, one of the issues that she cited — multiple issues, financial, and she alleged some financial concerns — some of them were that Mr. Jamison was given a $100,000 spending account that was not in the agency’s budget and he was able to spend that. McDermott: So, you got the phone numbers, you got the emails. Was there anything in your eyes that seemed suspicious in any of that? Clayworth: Their moving their location, it’s a $17 million cost. It involves a lease that was signed without telling the governor and a few other top state officials about a third-party consultant’s recommendation that it remain at its current location. I mean, that’s pretty significant, so you have a third party say that, and then you have Mr. Jamison’s own staff in these emails that we were reviewing, their internal communications showed that it would have saved the state $6 million if over a 20-year period … to remain at their current location, to renovate the current location versus renting a space. So those are significant questions. McDermott: And their location now I take it is fine? There is nothing wrong there? Clayworth: Yeah, their location is not too far from here, actually. McDermott: Yeah, this is nice area. Clayworth: It’s a nice building, it is an older building and it needs some work, but they had some consultants look at it. And so there was information that was not shared with some of the key decision makers and that’s apparent. I mean, we know that from the records at this point. And so, that’s a serious issue. So, there are all these issues. … The lease, for example, is just a question of how well our resources are being used. McDermott: And did Kim Reynolds know anything about them moving at all? Clayworth: Well, yeah. So there’s the group called the executive council which involves, I think there are five members on that, there’s the governor, the secretary of ag, the state auditor, treasurer (and secretary of state). So, these folks approved some of the major contracts of the state, including Kim Reynolds she’s on it as well. They voted to approve their move, but they did so not knowing all of the facts. McDermott: … So, they just didn’t have the full story. They knew they were moving and that was it. Ok, what did you do after getting all of these emails, phone calls and credit card receipts? Clayworth: I mean my focus has just been to report what I know. Clayworth: Oh yeah, lots of people, who never make it into the paper. For various reasons. Sometimes I don’t find them to be credible and my name is on these stories, so it is important to me. Also, some of these employees still work for the agency so I respect that they have to be careful. So I’ve interviewed a lot of people that we don’t quote, but it helps me in some way to understand the issue. McDermott: Yeah, so you’ve interviewed some people who have been fired in the past five years, but you’ve also talked to some of the current people still working there, kind of off the record? Clayworth: Well, yeah, I haven’t quoted any except the interim director who, she was very interesting. Clayworth: The interim director. She has worked there for five to six in an executive capacity. Carol Ann Jensen is her name. And she, the first interview that I did with her after this happened, she talked about how she had warned him about his language. I think that she’s sincere in trying to be honest about what has happened and what she has done to try and mitigate some of the problems that she has. McDermott: There was not account or accusations of assault? Just sexual misconduct? Clayworth: Not that I am aware of. The accusations were very detailed … There were two people that came forward. The letter was very detailed, but it didn’t contain any allegations that they were sexually assaulted. Just sexual harassment and questions and behavior that, if true, are unquestionably inappropriate for the workplace. Just talking about going to massage parlors and sending texts that were clearly, just stuff that was shady. McDermott: … So, once you had gotten the background information and the interviews did you do anything else? Or did you just start the writing process? Clayworth: It kind of depends which story I am working on. Because I have probably written a dozen stories at this point about the agency. So, what the story with the lease I mean that took a little bit more research. And to look at what the executive council was presented with. So, it wasn’t just looking at the records of Iowa finance authority but also going to the executive council and obtaining their records and seeing what was truly provided and talking with. I reached out to each member of the executive council, so the governor and the folks I just mentioned and offered them a chance to talk to me. So, one of them, Mary Mosiman, the state auditor – so this is where it gets kind of sticky, because she was good friends with him, and so was the governor. … She told me that, at one point he babysat her kids when they were younger. She worked with him in state accounting. Clayworth: And so, you have all these close relationships. And it makes it kind of an odd situation because you have all of the personal relationships intertwined with work and people have affiliation even though someone has been accused of some heinous wrongdoing. But they still have some allegiances and care about this individual. McDermott: So, what was the greater difficulty about this whole story? I know there’s more than one that’s just about the employment. But what has been the greatest difficulty about the whole process? Clayworth: Hmm, the unknown. Records have been a big challenge. For a long time, weeks we didn’t have the letter. But that’s what we as journalists do. We have to figure all of that out. And a big part of what I do in any story, a large amount of my time is spent seeking and fighting for records. And this case is really no different. In this situation the agency has been really cooperative. I give credit where credit is due, and they have been. That doesn’t mean there hasn’t been challenges and questions but, I feel like agency has worked with us pretty well. Clayworth: So that’s probably the biggest thing. McDermott: What would you say is the easiest part of this whole story? Clayworth: There’s a component of this sexual harassment issue, and the details of the sexual harassment that people quickly identify with … that helps garner reader interest. So, you have all these subsequent issues that are tied into it. Like, whether or not due process was provided to Mr. Jamison. You know, nobody asked him about his questions or the lease or his finances. It opens a door for people to take interest in issues other than just the sleazy aspect of this. The sleazy aspect is kind of just an invitation but then you hook the reader in, you get them to eat their vegetables. McDermott: That’s what I got, when I read it. Clayworth: And so that is the easiest part of this one. There is a salacious and human element that we immediately gravitate towards and I understand that as I writer, but I also understand there are issues that are also and perhaps more important than why he was fired. McDermott: Yeah… So, throughout this story where there any shocks or things that surprised you about this whole case? Clayworth: I’m still, yeah, okay, so the allegations were so very specific that what shocks me, that if true, how they continued for so long. McDermott: How far did they go back? McDermott: … So, in a story like this where there is a lot of controversy over who said and did what, how do you go about keeping … unbiased. And, where there any points where you thought that you could insert your opinion on this? McDermott: So, it’s more of a social justice issue you mean? Clayworth: Yeah, and whenever, I mean, I’ve written about those issues. And so, I try to remain cognizant about what my personal thoughts and beliefs are. … Did I approach the angle that I personally disagree with differently? And if I did I go back and try to rework it just to be far. Right? … But in this case, in this particular story, again it hasn’t seemed too difficult because to me it’s just black and white type issues. McDermott: So, when you have, I guess, you mentioned like abortion, gay marriage and this is more like a black and white thing, but there are a lot of unanswered elements to the story. But what would, I guess what would drive you to add in some of your own personal beliefs to a certain story? Clayworth: I try to never ever do that. Clayworth: Yeah, I try not to. But then again, my own personal beliefs, not concisely but there’s — again, who we quote and what we quote them saying is often times emotional, but that can lead to — our personal beliefs can focus our story. There’s just not doubt about it, and we have a tremendous amount of power as journalists to influence our stories. So, I try to be cognizant of that. I would never put my own personal beliefs into a story I’m writing. Clayworth: … You know I wasn’t always like this, but I am now. I really try to see the perspective of who I’m talking with whenever I’m interviewing them. So even if it is someone I disagree with, like philosophically disagree with them personally, I try to see the world through their eyes, at least when I’m having the conversation with them. So, like, abortion, for example there is a part of me that understands where somebody could say all life matters, because I think we all can agree to that. And so, when I’m interviewing them I try to, I just try to understand where they are coming from because I know they got their stand, and that makes it easier. But you know, sometimes you just run into hostile sources, right? And you just, there’s always going to be people who think the media is out to get them and that we are liberal hacks. McDermott: I know what you mean. Clayworth: Right? But I actually think that the opposite is more true. Clayworth: Oh yeah, I think there’s far more conservative bends in our profession than what people realize. I don’t believe that’s true. I believe that honest journalists, real journalists try to be fair, but we encounter that and there is just no way getting around that. We will always have people who hate what we do and that is okay. It is okay. McDermott: So, will there be any further developments in this story. I know you said that you are kind of going back and trying to find how long these accusations and possible facts have been going on for so what else is happening? Clayworth: I think there is going to be a lot of developments in this story. So, you have two audits going on, you have an independent investigation going on, so those three elements alone will bring about news. You know even they find nothing that’s news, but inevitably there’s some conclusion of those. Clayworth: … This story helps people understand this agency that is in charge of setting up the financing for low income families to have housing. It is important almost all of its revenue comes from the federal government and its investment with the housing. But it does really an essential job that is critical to thousands of people all over our state. I mean affordable housing is a huge issue, so, and that is something that is commonly overlooked. You know, people see the sexual harassment but don’t necessarily, immediately, understand the importance of why this agency is evenly in place. McDermott: Yeah. So, and then, the last question on this topic is, what is one thing you would like the public to know about this story. If there was just one thing that you could tell everybody involved, or even not involved what is just one thing that you would like to broadcast to them? Clayworth: Hmmm, I’m just trying to narrow it down to the most, what they should know. I’m not sure because there are so many elements to this story and there are so many unanswered questions still that I’m not sure that. I mean, if I knew the total outcome of everything I could say that, like if we knew that the allegations were true we could say, yeah Jamison is a dirty pig. Period, the end, but we don’t know that. There are a lot of unknowns and it very well could be the Salem Witch Trials of our local history. McDermott: Yeah, it could be. Clayworth: Right. Yeah, like,who knows? Who really knows at this point? I guess it would be, what I would want people to know that civic engagement and knowledge of their local government is crucially important to their life and that is what I hope people know and learn from this. You can’t put everything on auto pilot and expect magic to happen. We all have a cinema media, but citizens need to monitor and watch what their government is doing. The Iowa Center for Public Affairs Journalism-IowaWatch is an independent, 501(c)(3) non-profit program that does investigative and community affairs journalism as a public service in collaboration with other media, and trains college student journalists to do this work at a high level. It is a member of the Institute for Nonprofit News. Find out more at IowaWatch.org/. My role as executive director of the Iowa Freedom of Information Council has taken me from border to border in our state. The message I’ve preached at each stop is a simple one: Transparency is a fundamental part of good government, and government officials risk undermining their respect and credibility when they try to minimize their accountability to the citizens.